“How far is that from Atlanta?” It’s the inevitable question that every traveling Georgia native gets when he identifies his hometown and home state. Georgians smile and tell our new acquaintances that Perry, Americus, or Statesboro is 2 hours, 3 hours, or 4 hours south of Atlanta. Most of the folks we meet seem to think that Atlanta covers the entire state, but there are actually two parts of Georgia – Atlanta and NOT Atlanta. There are some wonderful places to see and visit in NOT Atlanta, and if you’re an RV camper, you’re also going to find some great places to stay. Not Atlanta moves at a slower pace, but you’ll find wonderful campgrounds with all the amenities – easy pull-thrus, wifi, laundry on site, and you might even be able to step out your door in the morning and catch a couple of fish at the campground lake. Perry, our small town south of Atlanta is a perfect stop for an overnight or a few days’ stay. Yes, it’s warm and sometimes humid, but there’s a lot to see and do nearby. In June and July, some of the most fun activity has to do with fruits and vegetables – specifically peaches and watermelons. Agritourism is a big industry in NOT Atlanta, and Lane Southern Orchards, just a few miles away from Fair Harbor RV Park, is a wonderful place to spend the afternoon. 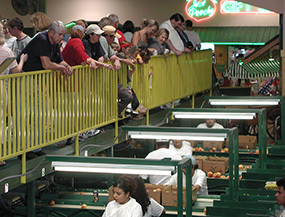 In June and July, fresh peaches are coming in and the packing house is busy. There’s a great restaurant for lunch, you can take a farm tour, pick some blueberries, and let the kids play on the big playground. Lane’s “roadside market” is massive and air conditioned. It’s a great place to cool off on a hot summer afternoon. Just a few miles down US 41 in the other direction, you’ll find the Cordele State Farmers’ Market. The Cordele market is the major watermelon distribution hub for the entire Southeast. You can still see “lumpers” (watermelon loaders) in action in nearby fields, and the farmers market is a great place to buy all kinds of fresh Georgia fruits and vegetables. There’s also a great stop for lunch, Yoder’s Deitch Haus, a short trip off the main road. You’ll get a warm and friendly welcome when you arrive at Fair Harbor RV Park and you’ll find it easy to maneuver in our spacious RV campground. We have plenty of pull-thrus, all the amenities, and shaded spots for an extended summer stay. RVShare.com ranks Fair Harbor among the top 10 Georgia RV campgrounds, and they also list 9 other great RV parks for the rest of your trip through NOT Atlanta. We’re an easy drive from the mountains or to the coast for your next Georgia stop. We’d love to see you soon!